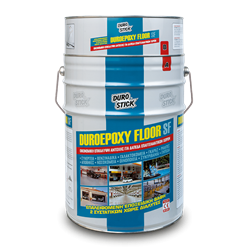 Highly durable self levelling colored epoxy paint without solvents. Exceptionally durable and resistant to abrasion, strong acids and alkalis. It is uniquely durable to solvents and oils, salt or chlorinated water, as well as extreme weather conditions. Creates unbreakable bonding on concrete, plaster, wood, MDF. Suitable for hospitals, dairy plants, wineries, kitchens and slaughter houses, garages, gas stations, laundry facilities, pools, fountains etc. Create anti skid surface by broadcasting QUARTZ SAND of DUROSTICK (with grain size from 0.01-0.5mm). Classified SR-B2, 0-AR0, 5-IR4 per EN 13813. Smooth surface: 250-300gr/m2 per coat. Anti skid surface: 400-600gr/m2 per coat.